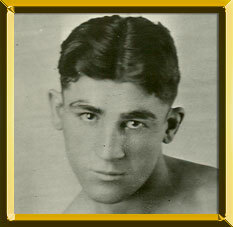 Born Christopher Battaglia on February 18, 1908 in Hartford, CT, Battalino won the 1927 National AAU featherweight championship. He made his pro debut later that same year and within two years would reign as world champion. On July 26, 1929 he met bantamweight champion "Panama" Al Brown and scored a 10-round win that took him from relative obscurity to the world stage. His next bout was a featherweight title go with Frenchman Andre Routis at Hartford's Hurley Stadium. In front of 25,000 spectators the 21-year old Battalino defeated Routis over 15 rounds to win the world title. Prior to his first title defense he engaged in several non-title bouts including a loss and a win to Charles "Bud" Taylor and Bushy Graham respectively. In 1930 he successfully defended his crown over Ignacio Fernandez, avenged his loss to Taylor, lost to "Kid" Kaplan and closed out the year with a 15-round title defense over Hall of Famer Kid Chocolate. 1931 saw three more title defenses over Earl Mastro (W10) and Hall of Famers Fidel LaBarba (W15) and Freddie Miller (W10). He also split two more bouts with Graham (L10, KO1) and registered a TKO win over Al Singer. Battalino's title reign came to a close in 1932 following a controversial title bout with Miller. He vacated the belt and moved up in weight to campaign as a lightweight. As a lightweight, he lost bouts with Hall of Famers Billy Petrolle (TKO by 12, L10) and Barney Ross (L10) and continued to box until 1940. Known as a courageous and rugged fighter with good inside boxing abilities, Battalino retired with a 57-26-3-1NC (23KOs) record. He died in Hartford, CT on July 25, 1977.